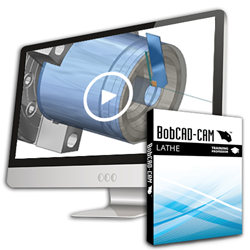 BobCAD-CAM, Inc. announced today the release of the popular CAD-CAM video training series for their new CNC lathe programming software, which launched in July 2015. Not only can the videos have an immediate impact on productivity and programming efficiency, but they’re also great to keep on hand for occasional refreshers and for getting new hires up to speed in less time. BobCAD-CAM Version 28 software is packed with new CAD and CAM CNC programming features, including faster drawing tools, smarter hole making systems, better surfacing toolpaths, increased tool type support, improved simulation, and more. The Training Professor Video Series offers how-to instructions on using the new features available for CNC lathe programming and CAD design in addition to the innovative features that BobCAD-CAM has developed over the past 30 years. This includes a wide array of CAD design tools, the software’s wizard driven interface, Dynamic Machining Strategies™, 2 axis turning toolpaths, simulation features, reporting tools, and much more. The detailed digital workbook guides users step-by-step through each lesson and includes a library of pre-made CAD files that correspond to the workbook tutorials. The self-contained and portable training format allows users to learn at their own pace within a comfortable learning environment. The Lathe Training Professor Video Series products are available for purchase from the BobCAD.com Store Page. Interested parties can contact a BobCAD-CAM representative directly for more information (877) 262-2231 x123. Demos of the new BobCAD-CAM Version 28 software are available for download from BobCAD.com. For 30 years, BobCAD-CAM has been dedicated to designing powerful, user-friendly and affordable CAD-CAM software. BobCAD-CAM products are used in CNC machine shops and schools all over the world - helping to automate the programming process for mill, mill turn, lathe, router, plasma, laser, waterjet, and wire EDM CNC machines. The company also offers solutions for CAD, artistic CAD, nesting, solid machine simulation, custom post processors, comprehensive training, and support packages.